At 30, Lara is finally fairly comfortable with who she is. Sure, she’s still terrified of commitment, and of getting too close to anyone, but she is finally secure in her identity, as the adopted daughter of Trish and X Reid, as a daughter whose skin tone is vastly different from that of her parents. No longer is Lara particularly interested in knowing anything about her birth mother, and never has she been curious about her birth country, Nigeria. All of this changes, however, when Lara’s birth mother, Yomi, shows up unexpectedly at her 30th birthday party. Now, for the first time, Lara is forced to think about her past and who she really is. Despite the name, Being Lara is not simply Lara’s story. Much of the book is actually from the perspective of Trish and Yomi, Lara’s adoptive and birth mothers. These sections with their alternate viewpoints may just save Jaye’s book, because Lara is, at the beginning of the book in particular, a bit difficult to take. Actually, she’s more than just a bit difficult to take, and if she had been the only focus of the book, chances are good that I would have abandoned it in frustration. Despite her happy family and the fact that she seems to be well-adjusted, she is incredibly immature and naive, overly stuck in her ways, and about as proficient at romantic relationships as a teenage boy. Obnoxious, and so flawed as to seem like a cliche instead of a living character. Luckily, her mothers’s stories – particularly Yomi’s story – add interest and give the reader something with which to sympathize. Eventually Lara becomes more life-like and easier to relate to, but it does take time, making the reader exceptionally glad for the way that Yomi and Trish’s stories intersect hers. This is a book that is more concerned with plot than prose, and that does come through. Jaye’s writing is solid, but it fails to overcome any apathy the reader might feel towards the storyline or the characters. 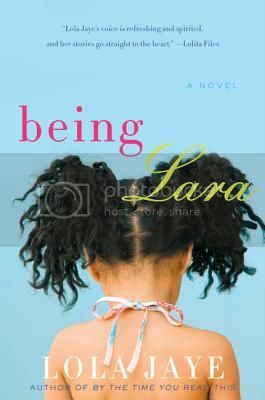 There is also – in the advance copy, a least – a continuity problem, wherein Lara and her best friend take a cab to her birthday party , and then Lara tears out of there in her own car after her birth mother surprises her. This may have been caught before the final, but as they took a cab for a very specific reason, it would have required some re-writing. Although Being Lara is an interesting story with a satisfying conclusion, the first half in particular failed to impress me as much as I hoped it would. Nothing like a title character you can’t “get into” to turn you off to a book. It sounds like she kind of pulls it together with the mothers’ stories. I hopefully the fix the taxi/car bit. That’s the kind of thing that bugs the cr*p out of me. I reviewed this book today too and I agree that Lara wasn’t a character to love. I loved Yomi’s story, and to a lesser extent that of Pat, her adoptive mother. I didn’t notice the continuity problem! I don’t usually notice those things, honestly, not sure why that one jumped out at me. I agree, Yomi’s story was much more interesting than Pat’s, I think I only liked Pat’s in comparison to Lara’s. I’m sorry you didn’t love this one like you’d hoped to.